The Bus Connecting Nozawa Onsen, Madarao and Iiyama Sta. 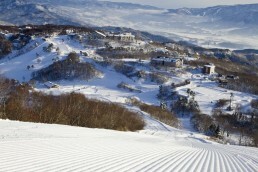 Kita Shinshu snow area withholds great ski resorts with the best snow condition in Japan. 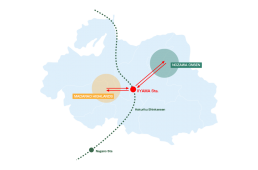 The shuttle connects two ski resorts and Iiyama Sta. in the area. *You can use the Shuttle bus without reservation. *Please pay when you get on the money. 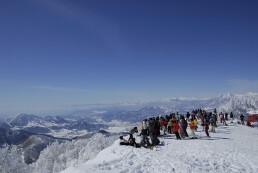 The Nozawa Onsen Ski Resort stretches from the peak to the foot of Mt. Kenashi, which stands 1650m above sea level. The skiing area itself covers an altitude of 1085m and has a total area of 297ha. Given its size, history, and amount of snow fall, Nozawa Onsen is ranked as one of the top skiing areas of Japan. With ample amounts of high-quality, powdery, natural snow, skiing and boarding is possible up until May. Along with a fun and exiting snow park, Nozawa Onsen is also home to a wide variety of slopes and courses, meaning that there is something for everyone. From professionals and advanced skiers to beginners and families, Nozawa Onsen is waiting to provide you with the perfect skiing experience! Standing at 1300m above sea level, the powder snow of Madarao Kogen can’t be beat! Here you’ll find a variety of slopes- 28 in all- to fit the needs of any skier or boarder.